Awesome! Way to go bud!! Thanks for the support Mike, much appreciated – though Heartbreak Hill will seem flat compared to what you’re facing this weekend. Run strong at Rocky Ridge! Well done ! Definitely got lucky with the 2:28 cutoff for 2016. You’ll love every minute of your first Boston. For 2017, qualify with at least 4 minutes to spare. The qualifying field seem to be getting faster all the time (I suppose the field size change didn’t help matters for 2016). Thanks for the kind words Krishna, and equal congrats to you – I never thought before registration started that the cutoff would creep north of 2 minutes. Which as you alluded to, presages an even more brutal 2017. I’ll be interested to see if/where this trend levels off, or whether the BAA does anything to tweak their qualifying times for specific age groups or across the board. I’ve gotta believe they love the hype around these two weeks, even if they could make their lives easier by adjusting the qualifying times again. Luckily I was able to take advantage of the 10-min jump from age 44 to 45, which honestly if I were them I might scrutinize more closely. But until they do… I’ll take it! Don’t know whether you’ve run Boston 2 Big Sur before, but I hope you’re considering it for 2016 – it would be good to meet out here on the West Coast, under less hectic circumstances than Boston. I have no idea how many runners enter the B2B lottery (which starts in < 7 hours), but I'll be disappointed if my name's not called, since not only is it a beautiful race but it's also just up the coast from us. I have entered the Boston 2 Big Sur lottery. I hope to meet you as well. I ran Big Sur in 2013; fortunately, there wasn’t a lottery registration for that year. Big Sur is indeed a beautiful race – the most picturesque and memorable road race I’ve ever run. Excellent, glad to hear it! Keeping my fingers crossed for Oct 12, and assuming we both get in we’ll definitely meet up at Big Sur if not sooner. You are more than welcome to join us in Tokyo this Feb and London in April for majors number 5 and 6. Pretty sure Marathon Tours still has openings. But you guys being internet moguls and new middle class home owners probably don’t hobnob with us lower class older slower runners. Don’t be silly, Jeff – there’s no older, slower more lower-class runner we’d rather hobnob with! And don’t believe everything you see on “Lifestyles of the Scarcely Solvent” – between RaceRaves and new home ownership, we can’t even get our backsides out to Indiana to run Tecumseh (which happens the weekend after our move). We miss meeting up with you guys in faraway lands – come to think of it, we’ve only made it out of California for a race once so far this year. So just as soon as our new money pit stops gorging on our bank account, we’ll have to remedy that situation and find someplace to meet up where none of us speak the language (like, say, Boston!). Congratulations on qualifying for Boston, and I am glad you got in. It was so much easier back when I ran it. And speaking of ‘back then’ I wonder if I will be able to run a couple of miles with you just like you ran with me. That would be cool! So what are your plans? Are you going to race it? Or take it slow to look around and enjoy the experience? Or even try and qualify for the next Boston at Boston? And don’t think I didn’t notice that you left Los Angeles off your list of Major World Marathons. What’s a race gotta do to get some love from you? Thanks, faster brother! It may have been easier back when you ran it, but of course your own qualifying time was much speedier than mine. And qualifying now is no doubt easier than it will be in 2025. As cool as it would be to do what I did in ’98 and run a few miles of the race together, I wouldn’t try it now – though I’m happy to vouch for you as security descends on you with their tasers and drags you off the course (“Don’t tase my bro!”). I’m just hoping the race can live up to the supercharged memories of those miles we ran past the Wellesley Scream Tunnel 17 years ago. Strategy-wise, at this point I honestly have no idea. My #1 priority is to soak up the day, and besides, as Krishna points out above I’ll probably have to run 4 minutes under my official qualifying time to return in 2017. So my strategy is up in the air, though luckily I have 7 months between now and April to fine-tune that. And just as soon as L.A. officially becomes a World Marathon Major (alongside Berlin, Boston, Chicago, London, New York and Tokyo), then I’ll treat it with the deserved deference. Right now, though, the race could use an image makeover – few people travel to California to run L.A., and it doesn’t sell out until the last minute (even then their claims of a “sell-out” are dubious, like NFL games that sell out because the home team buys up the remaining tickets). As much as I enjoy the race myself (and I’ve already registered for 2016), none of that screams “World Marathon Major in the making”. How exciting! Crossing that beautifully painted finish line is a life highlight, and I’m so happy that you get to experience it! As to your comment about fighting imposter syndrome…I actually found the Boston field to be much less intimidating than I expected. Considering the number of people I saw walking the Hills of Newton, I think you’ll easily hang with the best of them! Enjoy you’re journey to Boston! Thanks, Amy! So many details from your own 2013 Boston recap have stuck with me – amazing to think that was already over two years ago. Very much looking forward to not just the race but the entire weekend, because as competitive as the process has gotten, who knows whether I’ll ever get back? And appreciate the reassurance… the good news is that with such a wide range of age groups, I should be able to find my happy place somewhere in the middle of the pack. And despite any pre-race butterflies, once that starter’s pistol fires we’re all just runners doing what we do best! I was crossing my fingers for you this week, and I’m glad to see that it worked! Congrats!! I just drove up Highway 1 from Big Sur to Carmel – I can’t believe we ran all that way, and I can’t believe that you’ll (hopefully) do it again only a week after Boston! Appreciate the crossed fingers Jen, and congrats back at you and Tim! That stretch of highway is something else, isn’t it? We drove it in reverse (Carmel to Big Sur) after the race, and only then was I able to fully appreciate Hurricane Point and just how much the course ROLLS. It’s still hands-down my favorite CA road marathon. Hopefully next year (assuming my name is called) I’ll be able to run healthy and with two happy heels – though even then, I don’t envision Mike Wardian losing sleep over my threat to his Boston 2 Big Sur title. Congrats! You have achieved the dream of many runners. May you train injury free! Thanks Andy, that means a lot coming from someone with 6 Boston finisher medals! Congratulations, Mike!!! Can’t wait to read your review on Race Raves (and this blog) in April. Have a Dunkin’ Donut for me when you are in Boston. Thanks Kris, Katie and I are both happy to oblige – and I know it’s not the same as being in Boston, but next time you visit we now have our own Dunkin’ Donuts less than 10 minutes away! BOOM! Excellent news – I’m sure you are thrilled to no longer feel the buzz of your phone, heralding a new email, with dread and nervous anticipation. I too can stop that, as I got my fourth straight London rejection (no surprise there). But let’s not dwell on inevitabilities — you’re going to Boston! That’ll be four Majors down, with two dastardly tough lotteries left to conquer to round out the circuit. As it turns out, Uncle Jim got into Tokyo, so I’m looking forward to hearing what he has to say about the city and the course. 2016 is going to be a memorable year, Sohaskey. 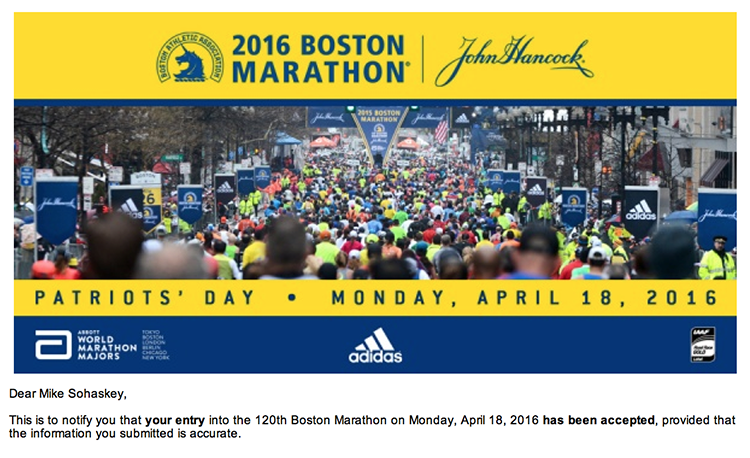 Glad to know I’ll have someone to track from Hopkington to Boylston. Chase that unicorn! It’s true – after all the waiting & fretting & trying to gauge statistical probabilities in my head, when the email finally arrived that initial dose of adrenaline was tempered by an equal-parts wave of relief. Add to that the disappointment of my friend missing out by two seconds, and this wasn’t quite the “cross finish line triumphant with arms raised, fists pumping and blowing kisses to the crowd” that I’d imagined Boston Qualifying would be. And until the B.A.A. tightens their qualifying standards yet again, those days are long gone for us five-minute-or-lessers. That said, I have no doubt Patriot’s Day itself will more than make up for the extended angst caused by The Process. All that said, let’s not overlook the promise of your own 2016 – here’s hoping it’s the year you get the call from London and notch your own irrefutable BQ. A pretty awesome experience that would be, lining up alongside each othah on April 17, 2017, right before you leave me in the dust.